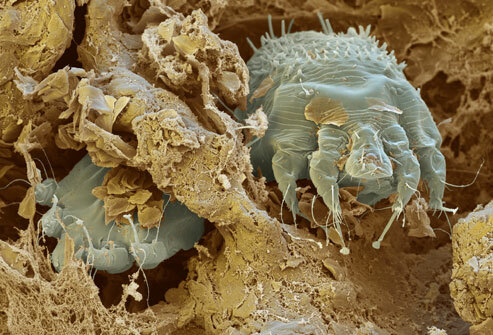 Scabies Are Tiny Mites That Live On and Under Your Skin. There They Breed and Eat (They are Literally Eating YOU!) and Yes, They Defecate Inside You Too! What Are Scabies? How Do You Get Them? Scabies are NOT a disease. You can't get rid of them with an antibiotic. They are a pest, a parasite. You get them from contact with another human being who has them. That contact can be direct skin-to-skin or it can be indirect like touching a door handle or sitting on a chair touched by someone who has scabies. Getting scabies is not your fault. It's just bad luck. There is currently a major epidemic of scabies in the United States and in many other countries all around the world. It's actually getting to be a very common itchy problem. You don't hear about it very much because people are ashamed or embarrassed to talk about it. What Treatment Should You Use to Get Rid of Scabies? The combination of our Enzyme-based Pre-Treatment and our Oil-based Treatments is second to none...it's the best way to get rid of scabies on your body and in your environment! We have Money-Saving Kits Starting at $37. The BEST is Truly Affordable! CLICK HERE to see all our kits. Scabies Killer Testimonial. This Gentleman Is Brave & Unselfish. How Many People Would Make A Video About Having Scabies? He Did. Even Though He Is VERY Shy, He Volunteered To Make This Video Because He Wanted To Help People Like You Decide To Use ScabiesKiller Products Instead of Naturasil or Some Other Ineffective Poison. Do you want a Discount Coupon Code? Click Here. The first 2 days, take an Enzyme Bath followed by a Hot Oil Bath. In the morning spray your affected areas with the enzyme spray and allow it to dry. Then rub the affected areas with the oil and work it into the skin. If possible, do not wash or shower it off. In the evening, ​spray your affected areas with the enzyme spray and allow it to dry. Then rub the affected areas with the oil and work it into the skin. Do not wash or shower it off. Use the Laundry Concentrate on your clothes and Change Clothes Daily. Never wear an article of clothing more than one day. Use the Diatomaceous Earth to sprinkle on your sheets unless you are washing your sheets DAILY. Click here to see all our KITS and PRODUCTS. When all the other products fail, Scabies Killer really works! 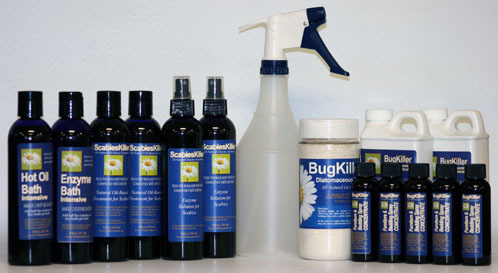 Scabies Killer Brand Products will help you FINALLY be done dealing with scabies. Get back to your normal life! NOTE: You will see a charge from ACCESS NUTRACEUTICALS on your credit card or bank statement. Please remember that charge was for your purchase today. Defective products may be returned and exchanged for a replacement. IMPORTANT: PLEASE FOLLOW THE DIRECTIONS FOR USE. YOU CAN FIND THE INSTRUCTIONS HERE.